Just a few weeks after Apple’s announcement to spend $1 billion on new entertainment content, the company is preparing to unveil an updated version of its TV app along with a new 4K-ready version of its Apple TV streaming box in September. The new TV app is going to be upgraded to include additional apps that offer live streaming. The Apple TV app was launched in 2016, but it didn’t include Netflix or Amazon Prime Video, two of the most popular streaming services. Apple has worked out its differences with Amazon and announced support for the streaming service. The new Apple set-top box will feature a faster processor capable of streaming higher-resolution 4K content and highlighting live television content, Bloomberg reported. The updated streaming box and TV app are part of Apple’s plans to rev up its video presence, which could also include earmarking as much as $1 billion for buying original series. Back in June, Apple announced that Jamie Erlicht and Zack Van Amburg were leaving Sony Pictures Television to join the company in two newly created roles to oversee video programming. 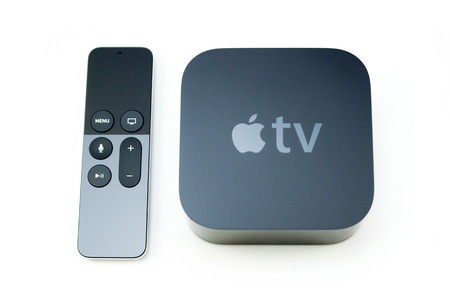 Apple could be hoping that a new, more powerful Apple TV will help capture some market share in a streaming box market dominated by the less expensive Roku. Recently released research from Parks Associates shows that Roku controls 37% of the streaming box market, up from 30% during the first quarter of 2016. Meanwhile, Apple TV is only in 15% of U.S. households.